Berg Adventures continues our spring season in Nepal with another great Everest Base Camp trek. 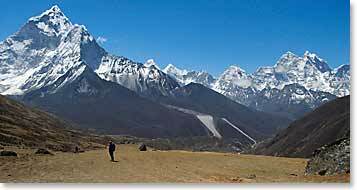 Our group will be walking in the shadow of the greatest mountains on earth and visiting the colorful villages and monasteries of the Everest Region. At every turn they will be greeted with the friendly faces of some of our oldest and best mountaineering friends. Each day will be full of surprise and adventure. Join guide Wally Berg, our Sherpa staff and our BAI trekkers as we travel once again to the "Abode of the Gods" at the base of the world’s highest mountain. May 21, 2008 – Back to Kathmandu on a helicopter! May 19, 2008 – Making our way back down to Namche! May 17, 2008 – Gorak Shep and Everest Base Camp! May 16, 2008 – We made it to Kala Patar! May 12, 2008 – Greetings from Thame! May 11, 2008 – Happy mother’s day! May 8, 2008 – We’ve made it to Namche! May 7, 2008 – The team has made it to Lukla without delays! If you've enjoyed following this Berg Adventures cybercast, please be sure to tune in for our next cybercast. Or better yet, contact us to let Berg Adventures help you with plans for your own great adventure!